Le Club AccorHotels has new promotion for Airberlin Topbonus member stays. 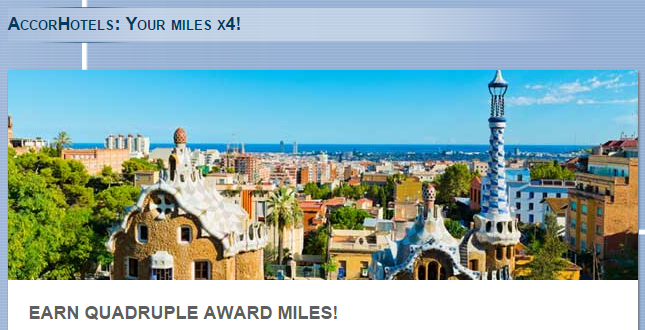 Topbonus members can earn quadruple miles at all Le Club AccorHotels participating hotels between October 1 – December 31, 2015. Note that you must have set your Le Club AccorHotels earning preference to miles and have Airberlin Topbonus chosen as the preferred airline. You must enable the autoconversion of points to miles after each of your stay to benefit from this offer. This offer is only valid for bookings made on or after August 17, 2015, and you can take advantage of it maximum FOUR times. This is fairly typical offer for Le Club AccorHotels. I would continue earning points and taking advantage of the bonus points promotions unless there is a sweetener from Airberlin Topbonus for partner transactions (currently there isn’t). • topbonus participants that are already Le Club AccorHhotels members and want to earn bonus points after each stay, need to select topbonus as their preferred reward option in their member account and activate the direct earn function here: (DE: http://www.AccorHotels.com/de/leclub/topbonus EN: http://www.AccorHotels.com/gb/leclub/topbonus).